FV865ND is a VFD panel manufactured by Futaba Corporation. It is designed to be used in DVD players or set-top-boxes. It can display 8 characters and it has a lot of symbols. I found it in a DVB-S2 receiver (Comag SL100HD) where it was controlled by HT16515 IC. 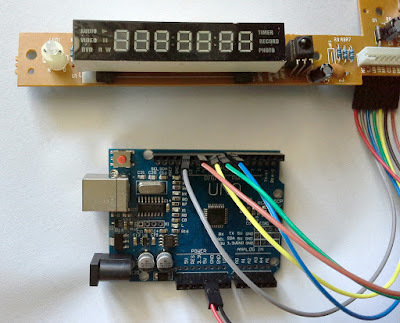 Fortunately, the front panel of this receiver contains everything needed to power the VFD (the power is supplied via a 5V line and it is converted to filament and VFD voltage by a small transformer). I couldn't find any software for HT16515 but its datasheet is available. The IC is 3.3V and 5V compatible and the nice thing is that the panel connector has different pins for IC supply and VFD transformer. The IC supports key scan too and the front panel makes use of only 7 keys (maximum 32). Data is sent/received via serial interface, SPI like. SC75823 is an LCD controller IC that is able to drive up to 156 segments. It is a 5V device that gets display data via serial bus. I found it in an auto CD player's front panel with 8 x 13 segment character LCD. I couldn't find an Arduino compatible library for it so I wrote one. The controller only supports writing data to it. There is no key input support like other front panel ICs that can control a display and read pressed keys. The panel I'm using had each key connected in series with a different resistor and the main processor read pressed key by analog read value. Since some keys didn't work anymore, I cut the PCB and removed extra parts, keeping only the LCD panel, its backlight and the controller. The communication protocol is probably Sanyo CCB (computer control bus), somewhat similar to SPI (it uses clock, data and chip enable signals). The controller has a pin INH that when LOW turns off the display. The library supports turning display off via this pin if connected or using software command. TM1628 is an LED controller IC that's used mostly at DVD players front panels. The IC can control up to 7 sets of segments (separate digits) and can also process input from up to 16 individual keys. 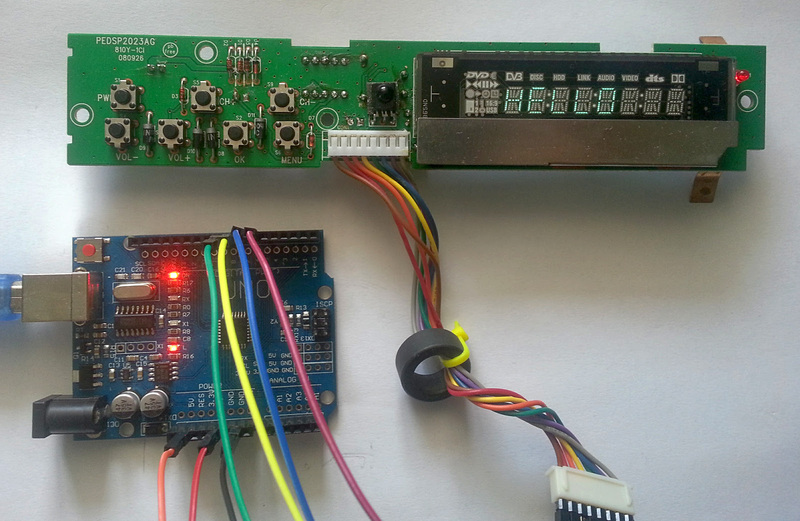 It is controlled via SPI compatible serial interface. 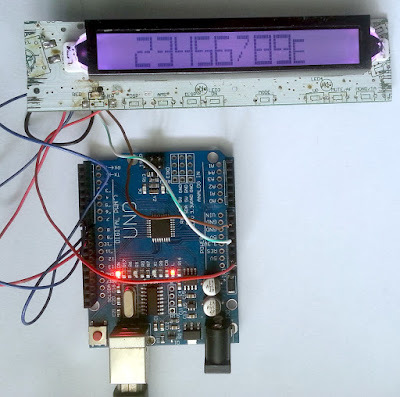 The only Arduino compatible library I was able to find for TM1628 is developed by Vasyl Yudin and is available on GitHub. But, I couldn't get any readable output on display. That happened because my front panel had a different segment assignment to the controller than what I found on YouTube (the display with disc icon on it). My front panel came from TeleSystem TS5.9RX DVD Recorder and it has 7 digits and some other indicator LEDs. The PCB also contains 5 keys - but I can expand it by adding more buttons. Below is a sketch example for this front panel. 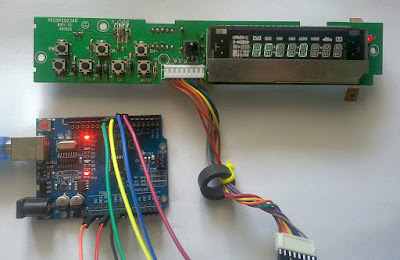 It is 5V compatible so it can be connected directly to 5V levels development boards like Arduino and compatible.